UGC 477: A faint low surface brightness galaxy hidden in plain sight. The low surface brightness galaxy UGC 477 is a bit slow in turning gas into stars. Click to galactinate. There are times when I glance at an image and right away I know something is peculiar about it. 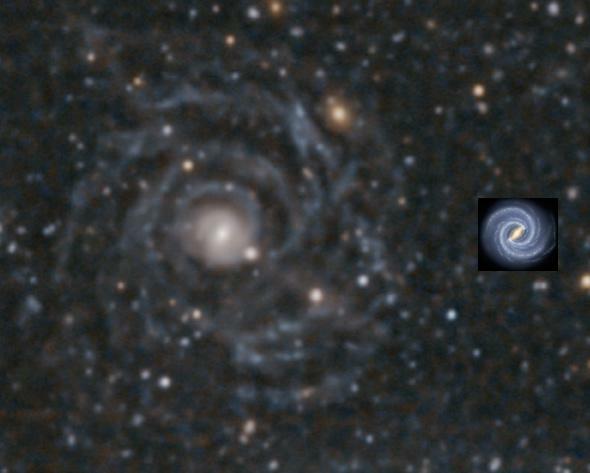 Such was the case for UGC 477, the very lovely but decidedly weird galaxy pictured above. The image was taken using Hubble Space Telescope, and only shows two colors; usually these images are the more natural-looking three-color red/green/blue composites. In this case, what you see as blue is actually at a wavelength of 475 nanometers (teal or blue-green to our eyes), and red is 775 nanometers, just at or outside the reddest end of what we can see (it’s fair to call this near infrared). The blue highlights the young, hot, massive stars and red the old, low-mass, cooler stars in the galaxy. To my eye the galaxy looks, well, raggedy. Most spirals seen edge on are smoother, or if they’re clumpy, the clumps have a pattern to them. This one looks like it just woke up in the morning and hasn’t had its coffee yet. It’s messy, disorganized. It turns out that’s really the case. 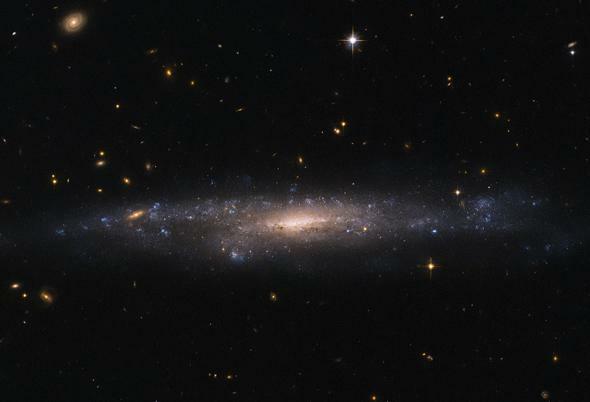 But it’s weirder than that: UGC 477 is what we call a low surface brightness galaxy, or LSB galaxy. As the name implies, these are pretty faint galaxies, sometimes actually much fainter than the night sky surrounding them. Our own galaxy is a disk, and would easily swamp the light from UGC 477 if the latter weren’t located well above our own galaxy’s plane, where stars and dust are less populous. The galaxy is about as big as our Milky Way, 100,000 or so light-years across, and it’s 120 million light-years away. At that distance it should be bright and fairly obvious, but instead is much dimmer than you’d expect. This may be due to a lack of star formation in it; although you can see some bluish clumps where stars are being born, most spirals have big, splashy nurseries in them. UGC 477 seems to have a much larger gas to star ratio than other galaxies, unused material from which to make stars. Malin 1 is just ridiculously huge. Here it is compared with a drawing of our Milky Way. That’s to scale, folks. LSB galaxies may be isolated from other galaxies, in regions of space called voids. This means they don’t suffer collisions as much, which is one way to build a giant galaxy, and to crash gas clouds together so they can form stars. It’s something of a mystery as to why LSBs can be so big then, though. Malin 1, another LSB galaxy, is a freaking monster, five times or more bigger than our Milky Way! Yet it’s far fainter than you’d expect for such a beast. Interestingly, LSB galaxies appear to be dominated by dark matter, making them good test beds for models on how this affects galaxy formation, growth, and shape over time. We actually don’t know as much about these galaxies as we do normal ones, since they’re so dim they were only discovered recently, and they’re difficult to observe. Hubble is ideal for this kind of study, though, at least for nearby ones—but even its mirror is too small to collect enough light from ones substantially farther away. But as telescopes get bigger, and our detectors more sensitive, we’ll learn a lot more about these odd denizens of deep space. What were they like when the Universe was young? Pretty much as they are now, or were they substantively different? Hopefully soon we’ll know, and put into place have yet another piece of the puzzle that is our Universe.